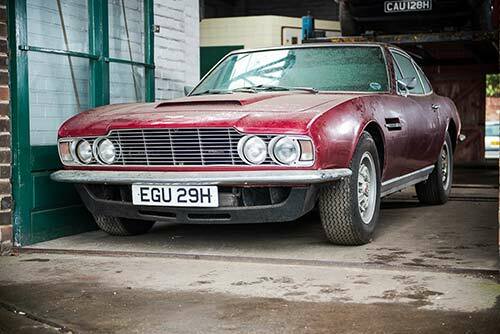 Two beautiful Aston Martin DBS restoration projects, both estimated at between £20,000 and £25,000, will be going under the hammer at the first Restoration Show Sale on April 12th. The Aston pair are both offered from a large private collection and are just two of the highlights in Silverstone Auction’s 80 plus lot auction taking place at the NEC, Birmingham. Having had just two former keepers, CAU 128H is a very rare manual 1969 DBS Vantage, one of just 70 right hand drive models in the most desirable Vantage specification. The car was acquired by the current owner in 2002 and used for just one year before being placed in storage where it has sat for the past ten years. Largely untouched, the car is in highly original condition and has survived storage remarkably well with the engine still turning over. Included in the sale is a fantastically detailed history file dating back from new with its original warranty card and owners handbook. 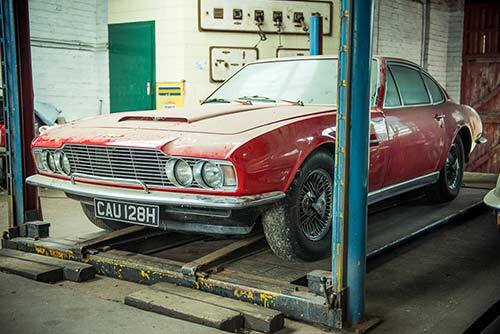 The second Aston Martin DBS restoration project, EGU 29H, is an early Series I 1970 DBS V8. The car is presented in Dubonnet Rosso with tan leather interior and features the engine that the DBS was always supposed to have, Aston’s legendary V8. Having only covered 27,700 miles, it has stood the test of time very well having also been barn stored for the past ten years along with its older brother. For more information on the sale please visit http://www.silverstoneauctions.com/the-nec-restoration-show-sale.